As the leading European association the EBA is committed to the active promotion of the deployment and use of sustainable biogas and biomethane production throughout Europe, and as such has created a wide network of established national organisations, scientific institutes and companies. A recent Global Market Report states that favourable government initiatives including feed in tariffs, renewable portfolio standards, tax incentive schemes and direct subsidies are all driving the European biogas market. The industry has witnessed steep progression in the last decade on account of rising concern towards energy conservation. Depleting conventional fuel resources favoured by stringent reforms pertaining to greenhouse gas emissions are all predicted to foster growth. Growing demand for biological waste treatment, coupled with favourable government measures to encourage and promote renewable energy utilisation, is all set to stimulate the biogas market. The introduction of incentives by respective authorities meanwhile is predicted to further encourage the adoption of anaerobic digestion (AD) plants. The report details that AD accounted for over 60% of the European biogas market share in 2016, and predicts that increasing demand for treating high moisture containing organic wastes looks set to augment the industry potential. The fourth edition of the annual event presents the perfect opportunity for industry experts to network and share best practice in order to harness the opportunities for AD across Europe. The EBA’s sessions will focus on the theme of “Greening Gas” from a national and regional perspective, biogas production and anaerobic digestion best practices, cross-border trading of biomethane, gasification from R&D to commercialisation and power-to-gas. Particular attention will also be paid to the theme of transport, with sessions dedicated to biomethane as a transport fuel. Speakers will address these issues from a technical, economic, scientific and political perspective. During the three-day conference, Geotech will be showcasing its latest innovation to the European market. The BIOMETHANE 3000 is an industry leading fixed analyser, designed to monitor high levels ‎CH4 at 95%+ and greater levels of accuracy for O2. The innovative system marks another milestone for the global player, as it diversifies its product offering to suit the growing needs of its customers in over 60 countries across the world. 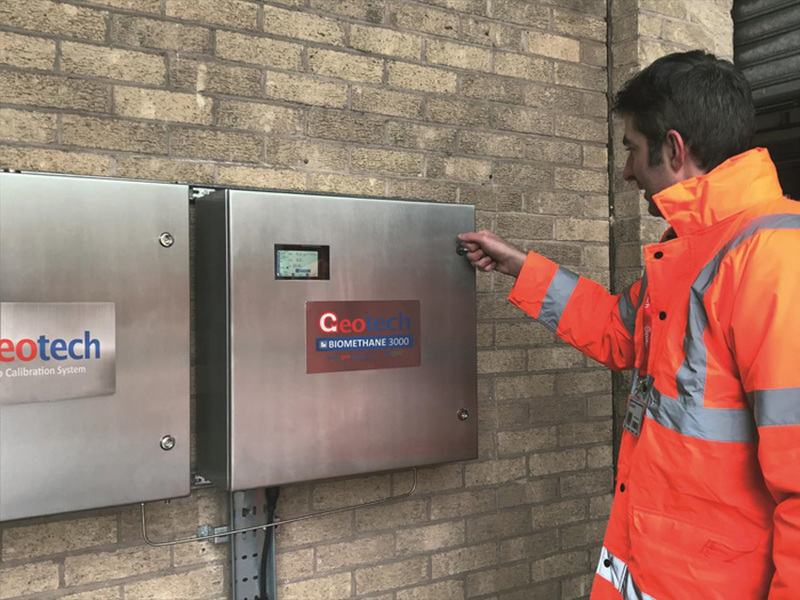 The BIOMETHANE 3000 features an auto-calibration function and Geotech’s ‘hot swap’ module to ensure there is no downtime during service and calibration, prevent unnecessary plant downtime expense and avoid the cost of flaring off poor quality gas, which adds huge costs to business operations. From the initial concept, the BIOMETHANE 3000 was designed with the international market in mind; to have the market leading multi lingual user experience, product literature and unrivalled in-country customer support at hand with a 30+ strong network of distributors in Europe. Following successful trials of the product across the globe, customers can have peace of mind that at first stage analysis they will have accurate results around the 98% methane level and below the 1% oxygen level. Participants at the EBA Conference 2018 are encouraged to visit Geotech, where they will be able to observe and learn more about the BIOMETHANE 3000 as well as other key Geotech products and solutions for the Biogas market.